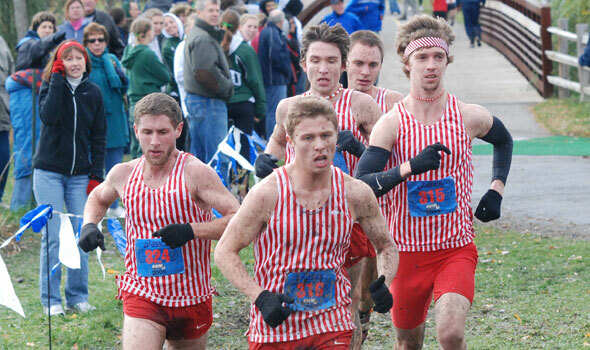 NEW ORLEANS – For the ninth consecutive week, the North Central College men’s cross country team is the top Division III squad in the country according to the U.S. Track & Field and Cross Country Coaches Association (USTFCCCA) Top 35 Coaches Poll, released yesterday. North Central garnered 280 points to hold the top spot with UW-La Crosse moving up one spot to second with 270 points. Geneseo State (N.Y.) is third with 266 points followed by defending national champion Cortland State (N.Y.), who falls two spots this week to fourth with 255 points. UW-Stevens Point rounds out the top five after receiving 246 points. College Conference of Illinois and Wisconsin rival Augustana College is 11th with 193 points. The Cardinals captured their unprecedented 26th straight CCIW Championship on Saturday, scoring a perfect 15 points as the team swept the top nine spots in the race. It was the fifth time in school history the team recorded a perfect score at the CCIW Championships and the first time since 2004. Sean Carlson took home top individual honors, crossing the tape in 26:33.8 for the 8,000 meter course to edge out runner-up Michael Spain by two-tenths of a second. Kyle Brady was third followed closely by Neal Klein and Nathan Rutz as all five runners finished within one second of each other. All seven Cardinal varsity runners earned All-CCIW status while Al Carius and his staff earned CCIW Coaching Staff of the Year honors. North Central travels to Winneconne, Wis. on Saturday, Nov. 14, for the NCAA Division III Midwest Regional Championships. The men’s competition is scheduled to begin at noon. View the complete men’s rankings.